For casual style, step out in the Speed Canvas Shoes from Roper. This comfortable shoe has a tan canvas upper with elastic side goring for easy on and off. The moisture wicking lining, removable insole, swifter sole and lightweight EVA midsole provide comfort and support with every step. Whether you're going for a short walk, a long driving or simply relaxing, step out in comfort and style with these casual canvas shoes from Roper. Now you can proudly sport your Hooey anytime, anywhere! 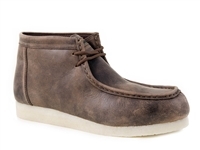 Kick back and relax in the Men's Cappie Dark Brown casual shoe. Kick off your boots and slip into these driving moc shoes from Roper. Designed with traditional western stitching. Ariat has a new Spitfire and it is now a slip on shoe. From the ranch to town, these Roper Chukkas are a perfect fit for style and comfort. The Hoxie is a distinguished leather boot with subtle stitching accenting the foot. Ride in style and comfort with the Horseshoe Kiltie Generation 2 tennis shoe riding boots by Roper. Our men’s casual chukka driving moc in our signature full grain leather features Twisted X’s patented CellStretch® comfort technology. The color combination is stunning! 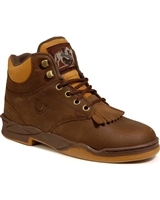 Look your western best with these Ariat Men's Sport Stratton Western Boots. Ariat continues to make enhanced performance a primary focus, combining advanced technology, premium leathers and thoughtful design and construction. The Sagen Brown 12-inch tall Men's cowboy boot keeps things simple with a chocolate brown leather exterior garnished with a tonal stitch pattern along the upper with coral accents. Our cowboy work line now offers the TWX Toe! Our SD molded, memory foam footbed is antibacterial, moisture wicking and machine washable and protects from foot fatigue.